This week’s and our final challenge was Japanese Cooking. We had a choice or various different Japanese recipes from Sushi, Tempura, Rice Balls and various other recipes. I chose to try some Sushi, I didn’t do a very good job but this was my first time. I will definitely make it again. 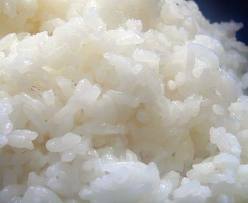 Made the Sushi Rice, according to the instructions on the back of the packet. This was soaking, bringing to the boil, cover and simmer and then allow to cool. I then cut the Sushi Nori Toasted to the size I wanted and laid it out on my chopping board, with some grease proof paper underneath. I don’t have one of those mat things, but I may invest. I took a small amount of the rice and places it on top of the Sushi Nori Toasted sheets and pressed down firm. I then added some chopped cucumber and a little bit of soy sauce. I rolled into a rough and I mean rough cylinder shape. I made several but very few stayed together or ended up looking remotely looking like sushi. I also used some prawns instead of the cucumber and some smoked salmon for a bit of variety. I have to say it was very fiddly and I was covered in rice so didn’t take many pictures. 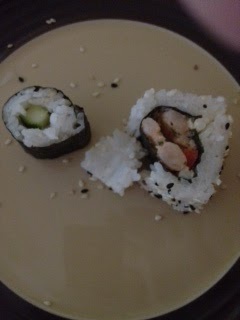 Here is the best of the sushi I made. The don’t look good but the tasted good and the boys enjoyed their first taste of sushi. I served this with some of the World Foods Chinese Ginger Garlic Dripping Sauce/Stir Fry Sauce. I will definitely give this a try again. Hopefully next time it will resemble a bit more like sushi. And I might even be a bit more adventurous with the fillings. 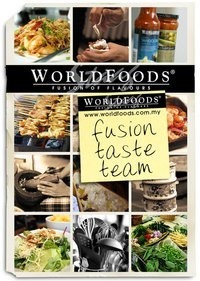 This was our last week in the World Foods Fusion Taste Team Challenges, it has been fun. We have enjoyed tasting and trying the sauces and the new foods we have made. Thank you World Foods for allowing us to be part of this. Check out the Worldfoods Facebook Page to find out what the other Fusion Taste Team have been cooking. Disclaimer:- I was sent some sauces through & encouraged to make the recipes as supplied by World of Foods.